I’m always looking for opportunities to not code. On a new project, we’ve been using Zapier to extract data from a source and store it in google sheets. Then we manually categorize the data. One of our challenges on this project is presenting the right amount of actionable data to the customer. After hacking our way to to accumulate the data using zaps, I had planned to build (code) a dashboard. But the dashboard will change many times as we iterate. So, I went looking for alternatives. I discovered that google sheets has an amazing range of functions that when combined can be useful as an MVP (minimum viable product). Here’s an example of a thin MVP built using Google Sheets. 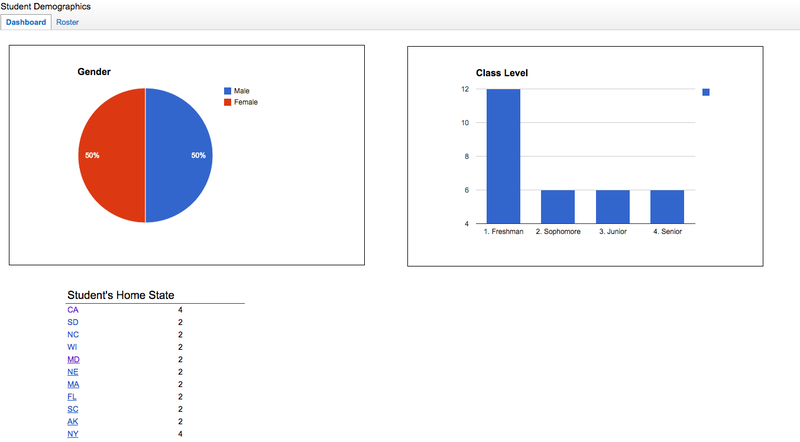 The example is classroom demographics tool, using this dataset. The example contains a dashboard with charts and tab for displaying all data. The charts were generated within google sheets on a single sheet. Both this sheet and an additional sheet were published to the web using google’s Publish A Document feature. Contained on the dashboard is the capability to “drill down” into datasets. In this demo, there is a chart displaying the ‘home states’ of the students. I link this chart to relevant datasets using google sheet’s query language. Google allows you to query a spreadsheet as you would any database and return the result as html. For example, in ‘Student Home State’ chart, I create a link for each row, using the hyperlink function and a query as the link. Another cool thing about this google sheet mvp is that authentication is already baked in. The published html is limited to the permissions set on the original spreadsheet. This is a pretty rough hack and can be used in cases where visual design faux pas are forgivable because the value provided is greater.